There’s a rebel in every crowd, and sometimes what appeals to them the most are the things that were common a hundred years before. Shaving is something most of us deal with daily and never think about, but our grandfathers were aware of a better way. That’s available to us still, provided we are willing to learn the old skills of sharpening and maybe a few nicks as we practice. The first time I checked out one of today’s straight razors I was very skeptical, but I learned very early in life that the mark of a sharp edge is the ability to shear the hair off your forearm smoothly, and I see no reason not to apply that knowledge to my face. Considering how many times I’ve cut myself with a safety razor that wouldn’t conform to my nooks and crannies and scars, maybe I’d do better with an edge I could actually see and control. That’s what a straight razor offers. You can see the blade, adjust the angle, cut a straight line the full length of your sideburns instead of piece by piece, and it doesn’t wear out. If it gets dull, all you need to do is strop it a few times and the magical edge returns, sharp and new. Consider how much energy and material goes into a packet of razor cartridges and you’ll see that the old-fashioned straight razor takes a load off the environment. Or think about saving the money it cost to do all that unnecessary packaging and throwaway design. Not sure you can maintain a straight razor’s edge? The DOVO Shavette takes full length disposable blades. 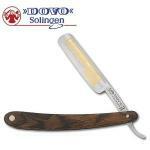 The DOVO Straight razor — no one told us a razor could look this good. Thiers-Issard straight razors are so good that people kept them. Now they’re on Ebay as collectibles. Though my instinct is to recoil and wonder why anyone would want to revert to the Dark Ages of shaving, the DOVO Shavette Straight Razor actually could be an excellent choice for men who prefer well-kept beards and moustaches to plain faces. 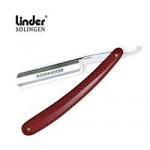 As we've seen before, an elite and close shave isn't going to get much better (if at all) unless you're using razors made from Solingen steel blades. Here's one of the razors manufactured by Dovo that features a Solingen blade as well as several other elite touches to tickle your fancy. 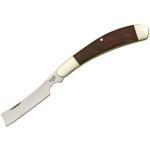 Shave with a straight razor? What is this, 1850? I admit I was skeptical the first time I tried it too. But once I saw Johnny Depp wield the infamous blade in Sweeney Todd, I was convinced I needed to give it a shot. And you know what? It didn't take long before I was hooked. Maybe it was the thrill of cheating death, maybe it was reconnecting with my ancestors, I don't know. But now that I'm a convert and have had a chance to reflect, I've made a list of the top 10 reasons why others should switch to a straight razor too. Some of these reasons may be tossed aside lightly, I admit. But if at least one of them rings true for you, beware -- straight razor shaving can be quite addictive. Some men have even been known to do it every day! No, you don't need to be a barber to shave with a straight razor. 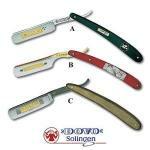 There's a thriving community of straight razor shavers out there and Dovo is one of their trusted brands.